This weekend a little sand, ocean, Christopher Columbus, a muscle car show and drag racing the lights until 2 am, OC Maryland, family time with grandparents, a little unplugged time, end of season Maryland blue crabs, and then returning to a crashed laptop, a skin rash, and a head cold...so are the ups and downs of this ride called life. Coming up soon, some progress news on The Giving Heart bag collection, other crafting for charity ideas, and that fabric printing how-to I promised. My, so much to do! Hope you are moving right along too! As always, love, love, love, Ann Voskamp's inspirational words...Best Tips for Effective Time Management...don't miss the video at the end...a wonderful, awesome reminder. We were never meant to work seven days a week by Kevin Martineau of Shooting the Breeze via The High Calling. Wild Olive designed some great simple embroidery patterns for the Stitch and Send project for charity! 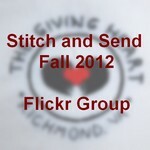 Stitch a simple embroidery patch, and send it to me to be affixed to a tote bag for The Giving Heart charity of Richmond, VA. I have fallen in love with these 2012 Christmas wall art pieces by between You and Me! Head on over to their Etsy store for more information.